Have you resolved to shed some excess pounds? You need a plan that leads to a sustainably healthier and trimmer you, so you're not back where you started this time next year. Some men tend to fixate on numbers and lose sight of other things. If you weigh 300 pounds and want to shed half your weight, for example, you just might get overwhelmed by the task ahead before you get started. Here's a better approach: Break your big weight loss goal into smaller, more realistic steps you can take to improve your quality of life, says Seattle-based registered dietitian and nutritionist Angel Planells. "Aim first to drop from 300 to 270," he says. "The health benefits of that 10% drop are tried and true." Blood pressure and cholesterol will likely improve significantly, and back and knee pain may ease as well, which allows you to be more active, further improving your health. "Small increments can lead to amazing quality-of-life improvements," says Planells. Not sure where to start? Here are two plans to consider. Intermittent fasting, which requires you to restrict eating to certain times. In one version called 16:8, you eat your normal diet during an eight-hour window, say from 10 a.m. to 6 p.m., then you fast for 16 hours. One theory behind the diet: By limiting your meals to daytime hours, your body is better able to metabolize what you eat. The result? 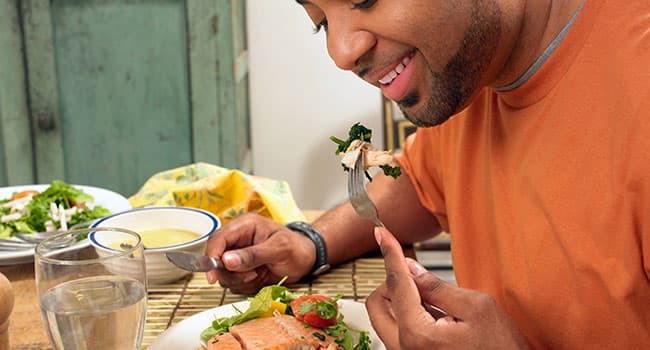 Some recent studies suggest benefits like weight loss, improved blood pressure, and reduced appetite, and, in men at high risk of diabetes, it countered some of the things that lead to the disease. Diet breaks, a different intermittent approach that a 2017 study found to work well for men. Over 4 months of dieting, men who alternated every 2 weeks between a low-calorie diet and a normal-size healthy diet lost 11 pounds more than those who dieted nonstop. No matter what plan works for you long-term, strive for more than just a number or quick fix, says Planells. "Your goal should be life change, not just pound change," he says. "Be patient, and focus on the process." What's the best plan for me? That depends on your goals, your motivation, and your health. If one plan does not work for you, keep looking until you find the right fit. How do I stay motivated? Focus on the potential benefits of weight loss. You eventually may need fewer medications, for example, or have more energy for your kids and grandkids. Do I have to change everything right away? No. Gradual shifts may make long-term change more likely. So if you drink a sugary soda or a sweet coffee drink every day, slowly wean yourself off of it. What's a good first step for making this work? Get your spouse or partner involved. When you reinforce each other's efforts and hold each other accountable, you both improve your chances of success. Angel Planells, registered dietitian; spokesperson, Academy of Nutrition and Dietetics, Seattle. International Journal of Obesity: "Intermittent energy restriction improves weight loss efficiency in obese men: the MATADOR study." Nutrition and Healthy Aging: "Effects of 8-hour time restricted feeding on body weight and metabolic disease risk factors in obese adults: A pilot study." E. Cell Metabolism: "Early Time-Restricted Feeding Improves Insulin Sensitivity, Blood Pressure, and Oxidative Stress Even without Weight Loss in Men with Prediabetes."